What a neat story, I got a mental picture of you guys on an the old scooter and the catfish skulls. Such a great memory and how great that Uncle George gave you a scooter! Nice memory! I might be able to handle a scooter, but I'm way past motorcycles. My dad didn't give us toys, but we always had a go-cart and then as we got older, motorcycles. He even made us a dirt track to ride on. Cute scooter. Those skulls were to show the monsters they caught. I love to cruise on my bike. I got started on a little bike one had to pedal to get it going faster. Ha fun! Would love to see you sprinting! (My sprinting days are over). how very cute!! so fun! How cool! I've never ridden a scooter, but it does look like it would be fun. I feel like that on a bike--I have so much fun and feel like a kid. Since you enjoyed your job at the vet's so much, have you ever thought about doing that work again? You'd be great at it, I'm sure. Awesome, Lisa. I'm happy for you and Paul; reliving your youth is a wonderful thing! What a sweet gift, and sweeter memories! Perhaps you need a catfish skull on the front of your new scooter? dat is toch heerlijk genieten. Your story reminded me of the Tom Hanks movie a couple of years back about an out of work retail store manager who buys a Scooter and joins a Scooter Club. I acquired my motorcycle license, but never renewed it (or used it) after encountering an intersection accident involving a motorcycle. The next day I placed my riding gear on eBay and sold it. But Scooters are different, and I'd like to try one out now! Oh, I just love this story, what great memories! I wonder if the catfish skulls are still there, do you know? The scooter is cute as a button, let the fun begin!!! 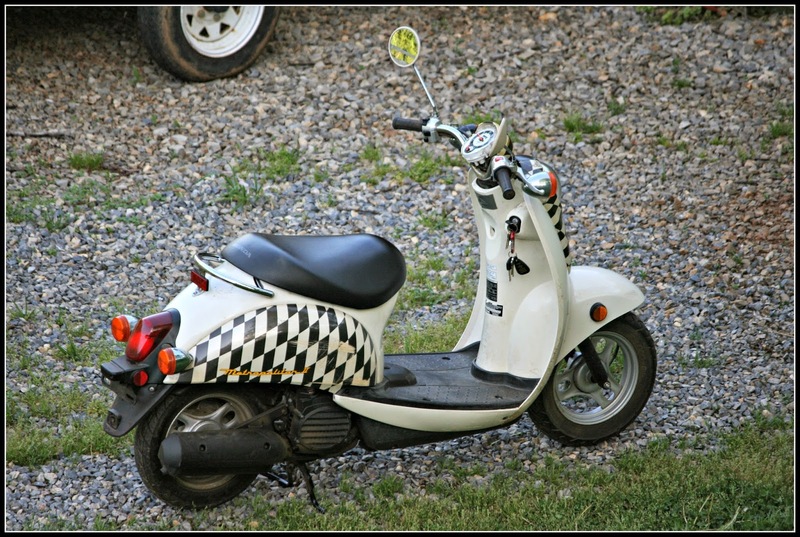 After reading the blog The Daily Coyote, I wanted a Vespa for the longest time! What a cute little motorscooter to putter around in. Enjoy! Seeing that reminds me of living in Europe. Pretty girls on Vespas. I wonder if they still ride those these days. That is a darling scooter! I bet you do have a lot of fun with it. I've never been one to even want to ride a motorcycle but a scooter would be fun. I am your newest follower. This is a fun read and good memories. It must be lovely reliving them on this cute looking Vespa. What fun! It will be great to have a scooter! That story and the scooter is just so awesome ! What a great image you have created. I could do without the speed as well, and also the catfish heads could remain absent. I am getting remembered of my college days! Those were the days..I remember going to school with the use of scooter!